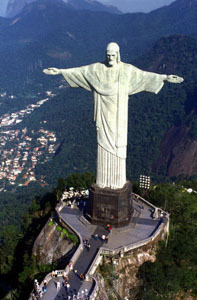 (russianorthodoxchurch.ws) For the first time in history, on October 26, 2008, bishops of the Russian Orthodox Church prayed for Russia and Brazil and for the unity of the Church at the world-famous statue of our Lord Jesus Christ in the city of Corcovado, over 700 meters above Rio de Janeiro, Brazil. The unprecedented divine service was held as part of the program called “Days of Russian Spiritual Culture in Latin America.” Afterwards, a Russian flag was unfurled at the feet of the statue of Jesus Christ, held aloft by enthusiastic Brazilians, along with tourists from other countries. According to Vladyka Platon, “a thousand years ago, Christianity was unified, but the second millennium saw it divided.” The division of the Church into Orthodox and Catholic occurred in 1054. Metropolitan Platon pointed out that there were also delegates of the Russian Orthodox Church Outside of Russia, headed by His Eminence Metropolitan Hilarion of Eastern America and New York, serving together with the bishops of the Moscow Patriarchate on Corcovado. “A happy event occurred only a year ago, on May 17, 2007—the reestablishment of Eucharistic communion between the Russian Orthodox Church of the Moscow Patriarchate and the Russian Orthodox Church Abroad. This is a great joy, which moved us to come to this holy place and bear witness to the fact that we are now in unity and commune from one Chalice,” said Metropolitan Platon. One of the greatest holy icons of Russia was placed at the feet of the sculpture of Christ, the “Reigning” Icon of the Mother of God, specially brought from Moscow for the veneration of the faithful of Latin America. Also participating in the divine services were His Eminence Archbishop Pavel of Ryazan and Kasimovsk; His Eminence Archbishop Mark of Khust and Vinogradovo; His Grace Bishop Evtikhii of Domodedovo; His Grace Bishop John of Caracas; Archimandrite Tikhon, Prior of Sretensky Monastery and other clergymen. The services were attended by Alexei Labetsky, the Consul General of Russia; Sergei Kirienko, the head of Rosatom (the Russian nuclear agency), members of the Russian Ministry of International Affairs and other cultural figures.